From June 25 through July 5, 2017, the National Education Association (NEA) held its Annual Meeting and Representative Assembly in Boston, Massachusetts. The NEA is the largest labor union of 3 million members who work at every level of education that span from pre-school to university graduate programs. Formed in 1857, the NEA’s “mission is to advocate for education professionals and to unite our members and the nation to fulfill the promise of public education to prepare every student to succeed in a diverse and interdependent world.” Members include public school teachers, educational support professionals, higher education faculty and staff, and school administrators. The Hawai‘i State Teachers Association (HSTA) is an affiliate union of the NEA whose members come from the public schools throughout Hawai‘i. Its Secretary/Treasurer, Amy Perruso, a teacher from Mililani High School was one of the first teachers to begin teaching about the illegal overthrow of the government of the Hawaiian Kingdom and the illegal American occupation that followed. The textbook that she uses is Ua Mau Ke Ea—Sovereignty Endures: An Overview of the Political and Legal History of the Hawaiian Islands by Dr. Keanu Sai. 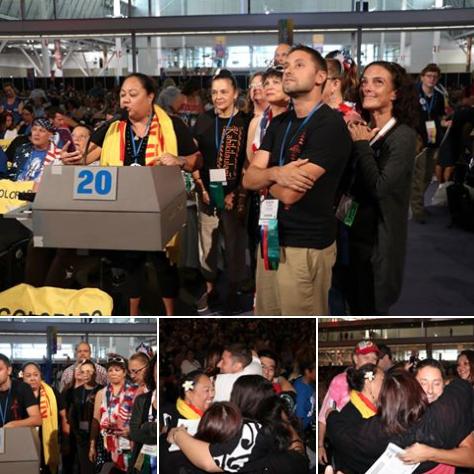 According to the HSTA Facebook, Chris Santomauro, a teacher at Kane‘ohe Elementary introduced the proposal, and Uluhani Wai‘ale‘ale, a teacher at Kualapu‘u Charter School on Moloka‘i gave an impassioned and articulate argument in favor of the proposal and it swayed a majority of teachers from across the United States to support it. Bravo! Bravo! Time to end this lying narrative. And now is the time to undo what they started in 1906 with the DOE program of brainwashing the Hawaiian Children in the schools. New Hui, for Restoration, focus is restoration only! I went thru the time of brainwashing, I am in my 70ties, I know the truth of that times. I am so happy to hear what the DOE, are doing. Civil beat! Where’s your coverage on this epic gathering of the minds!!!!! This may make international news b4 it makes news in Hawaii. ? Is this the beginning of Restoration? There is no Treaty! It’s has been, over 120yrs, since we have been occupied. Go on my web page: manaoha.org, there are 10pages of information, I have my ph#, and email there, to communicate or questions! Ben there is a lot correct about what you are saying. However there is a Treaty of annexation but it is a unilateral one. Francis Boyle has helped some countries, but he is working with usurpers here. He is an international lawyer but he says two completely opposite things. In that the kingdom still exists he correct but thatʻs obvious or nobody would be coming to ask the Hawaiian people anything at all today. He is really preaching the formation/creation of a new government not the restoration of the only legitimate government here. He is not preaching righteous upholding of the agreements made between HM Kauikeaouli, the people and the chiefs at the time of the once and forever division of our lands. The life of our land can only be perpetuated in righteousness toward these agreements. We are already contracted (bound) together as one, and our land already in a trust. The Crown the land and the people are ONE. Yes, it is true, we do have many claims to the Gov., everyone one of them should submit their Papers of qualifications, and let the test of truth be done! A little history of me, after high school 64, I tried college, got drafted 65, signed up, got brained washed, join RA, did all training, 66 orders changed to south east asia, landed at Saigon Airport, got kidnaped, of the plane (4 of us from Hawaii), we were together, from the beginning the 11th all Hawaii Company, my claim for that incident denied! So what do I do today, continue the truth, till they stop, denying the Restoration! This is a long time coming thank you so much Keanu. Now if it could only correct the other BIG LIE – the convenient lie used by Dole to justify a regime change, (that there are no lawful successors to the throne of the only rightful government here) we would finally be able to restore law and order in our country, peace, tranquility, unity and the strength that comes with consensus. Consensus is possible. Knowledge is power. Or the knowledge of truth is power, read fab’s book Restore the Kingdom of Hawaii, is available at Amazon! He is an International Lawyer, that has helped many countries. And I am requesting his help, for our Restoration. He has knowledge to begin the process, and is well known at the UN. Restoration, is our main goal! Aloha Ben, Could you explain your statement about requesting the help of Attorney Francis Boyle for our restoration. Are you doing it on your own or with the approval of the Acting Hawaiian Gov’t? Aloha Ben, I was able to watch a video of Francis Boyle and read some of his articles regarding the Hawaiian Kingdom. I don’t trust anyone who talks through two sides of his mouth. He repeatedly contradicted himself. The one thing he made clear is that he is Bumpy’s advocate. Yes, I know, my brother Paka, was his running mate growing up, his mom is my mom, but different dad’s. If you feel that fab, is not correct, than send me Bumpy’s phone#, and I will call him up, and get what he thinks, or he could call! He also know my Cousin Ding! I am very open, check my email, Restoration is my aim, as explained in fab’s Book! Aloha Ben, If restoration is your aim as according to Boyle then you don’t consider the Acting Hawaiian Kingdom gov’t to be legitimate and the process they are following toward restoration is wrong. Then I would have to conclude you are trolling this site. Well kekoa, are you working with US or others, is this divide and get your way? You started with Bumpy and now Keano, we are also family! What are you trolling for? Are you afraid of Restoration?! Are you doing anything about it?! Sorry for the unfinished post prior to this one. It is disrespectful to troll the site of the acting gov’t preaching of another process that undermines what the Acting Gov’t has accomplished and is trying to do regarding restoration. Why not post it on the nation of Hawaii’s site where it belongs. Don’t try to spin this on me it is all on you. There is one and only one legitimate De Jure government here. In reality, it is a Constitutional Monarchy and there are living legitimate heirs of it. Period. This family can prove in law that they inherited the dynastic right to rule the Hawaiian Archipelago from HM Kauikeaouli. They have passed this private property (dynastic right NOT legislative right) through their family and have maintained and preserved their claim to this private property so it could never be deemed abandoned in international law. Proving all of this takes a significant amount of tangible evidence. It has already been done internationally and this family is already being recognized for this active (as opposed to abandoned ) claim by royal houses both ruling and non ruling world wide. If anyone else thinks they have enough evidence to prove an active legitimate claim is more than welcome to prove it. It takes more than a genealogy. It takes more than being from the loins of a King. The dynastic right has to be passed in law and the only one who can do that is a sitting King IN HIS COUNCIL and it has to be publicly proclaimed. Those who cannot similarly prove their claim, and who are writing their own constitutions, electing and appointing their own monarchs and officers, is a would be usurper of the only rightful government here. Anyone and everyone who canʻt prove it. The Royal Order is supposed to serve protect and herald the legitimate Crown. I havenʻt seen that yet. I just see ALL the sovereignty group leaders taking liberties with something that they did not inherit, and grasping at glory that doesnʻt belong to them. They use photos of the throne room all the royal seals all the old photographs to give the illusion that they are true patriots and that what they are doing is sanctioned by the legitimate claimant of our deposed monarchy. None of it is. Ben Nihi you are correct, Francis Boyle contradicted him self 20 times in a half hour during one of his talks. I counted. I donʻt care how many degrees he has. Freeing Palestine is not in restoring of a Constitutional Monarchy that has never been dissolved. He lacks experience in dynastic law, and yes there is such a thing. please read The Entitlement to Rule by Steven Kerr. He is not correct about who our lawful claimant is but he couldnʻt possibly know all our history, law and who has protested so as to maintain and preserve their claim and who has not. This book is of great value to us since we were deprived of this knowledge being raised in the schools of those guilty of many egregious crimes against our monarchy – our country. Most Hawaiians donʻt even know what their countryʻs legitimate government is, nor who its lawful authority is. How can law and order peace and tranquility be restored until these two things are fully comprehended and completely understood? Well Kekoa, & K.Fraser, I did not say fab, did anything wrong, you both did, so please do not add words, to my comments! Did you guys tell Bumby, what fab did?! Yes we all know the truth, and I am passing the message, and I believe more us, should be better!? And being a Kupuna, I have every right as anyone else! What do you guys, Think! It left a lasting impression on me ,all this time finally something being said, and people are actually seeing the whole picture on what really happened! Mahalo nui! “The NEA will publish an article that documents the illegal overthrow of the Hawaiian Monarchy in 1893, the prolonged occupation of the United States in the Hawaiian Kingdom and the harmful effects that this occupation has had on the Hawaiian people and resources of the land.” I look forward the peace education materials that need to be constructed … similar to the Hawaiian culture based curriculum materials for the healing of public school students .. of all ethnicities, and Native Hawaiians for their uniques situation.